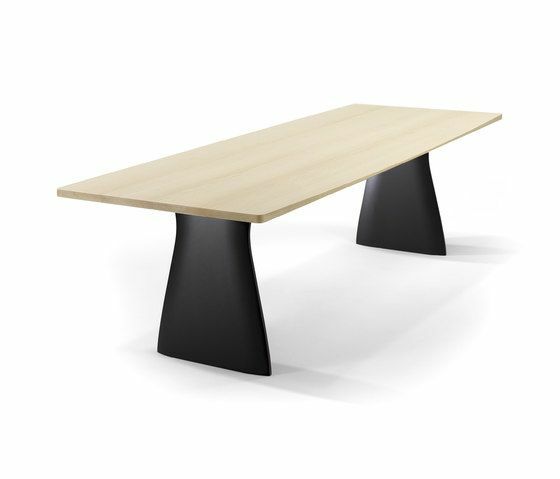 This table may be oval in shape, but it is rectangular in appearance – which is what makes it so fascinating. This optical illusion was achieved by varying the thickness of the tabletop, which slopes off slightly towards either end, while the underside is bevelled – and bevelled most where it is at its widest. This table is extremely exclusive – equally suitable for an exquisite dinner or a high-level meeting. And all of this thanks to a solid, beautifully crafted tabletop with two sturdy columns to support it. Painted black-brown, these are sculpted in such a way as to maximize the leg room under the table. Tabletop made of solid elm or American walnut. Feet made of MDF, painted dark brown (RAL 8022).